Thirty-one well-defined human adenovirus (Ad) serotypes are classified into five subgroups, A to E, according to their DNA-DNA homology (Green et al. 1979) as shown in Table 1. The members of subgroup A (Ad12, Ad18, and Ad31) are highly oncogenic, inducing tumors in newborn rodents at a high frequency within a few months; those of subgroup B (Ad3, Ad7, Ad14, Ad16, and Ad21) are weakly oncogenic, inducing tumors infrequently and only after longer periods; members of subgroups C to E are nononcogenic but transform rodent cells in culture (summarized by Green 1970; Tooze 1981). 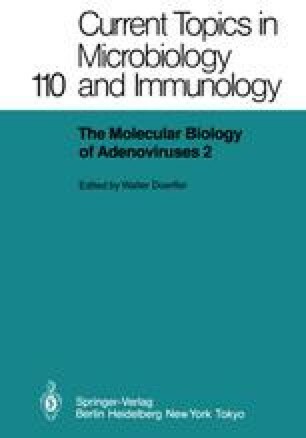 Transforming genes of the human adenoviruses Ad12 (Yano et al. 1977; Shiroki et al. 1977; Mak et al. 1979; Yamashita et al. 1982; Byrd et al. 1982), Ad31 (Yamashita and Fujinaga 1983), Ad3 (Dijkema et al. 1979), Ad7 (Sekikawa et al. 1978; Dijkema et al. 1979), Ad2 (Graham et al. 1974), Ad5 (Graham et al. 1974), and Ad4 (Yamashita, Nara, Suzuki, Ueno and Fujinaga, unpublished work) are located in the terminal region, early gene block E1 of the viral genome, and restriction DNA fragments containing these regions can transform rodent cells in culture. This review summarizes our studies on the organization, integration, and transcription of transforming genes of oncogenic Ad12 and Ad7.